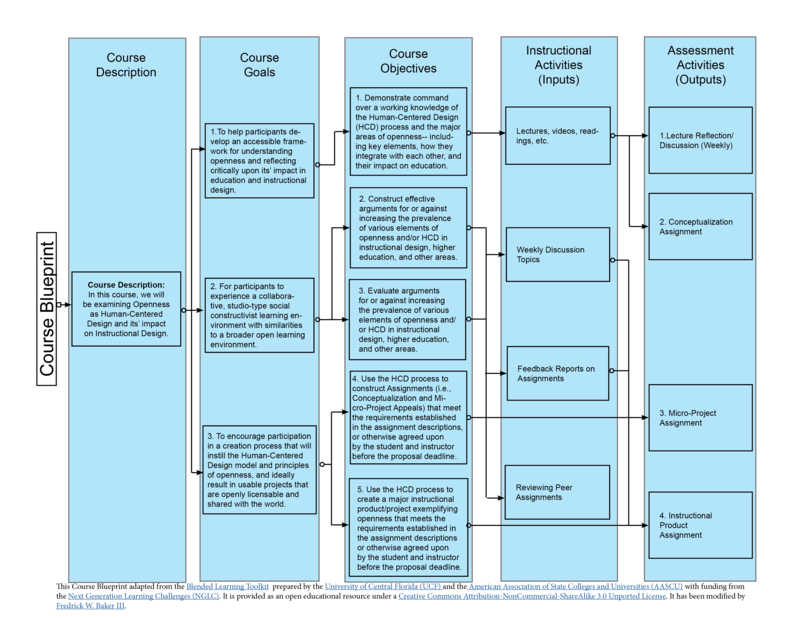 Course Alignment Blueprint – Fredrick W. Baker III, Ph.D.
A course blueprint is a visual articulation of the alignments between goals, objectives, instructional materials, and assessments in a given course. The idea is to show how each element in the course is tied to the stated goals and objectives from the course. I used the Blendkit Course Blueprint as a base and made it more granular and explicit. I also clarified some potentially confusing terminology in the blueprint. 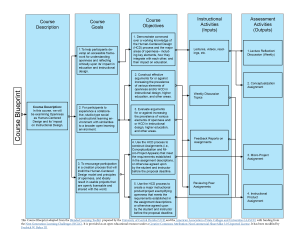 This version highlights course goals, objectives, instructional inputs (instructional materials, lecture, video, etc. ), and Instructional outputs (assessments, projects, discussions, etc. ); provides more detail at a granular level; and allows for one item box to contribute to several sub-level items. It is made in Adobe InDesign, and contains content from a course I created. Please feel free to reuse according to the licensing agreement!